Leshan Leshan is about 180km south to Chengdu and 20km west to Emeishan, located in the southwest area of Sichuan province. 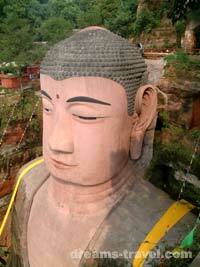 Leshan is a cultural city with a history of more than 3000 years and a mordern city as well. Because of the rapid city development most of the old buildings have been torn down but fortunately the Giant Buddha remains intact. 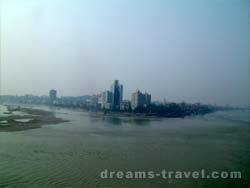 Nowadays,it attracts milions of visitors from home and abroad. 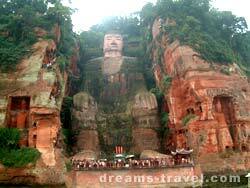 Leshan Giant Buddha Leshan Giant Buddha, the largest stone sculpture of Buddha in the world, sits at the confluence of the Minjiang, Dadu and Qingyi rivers. According to records, the carving of this giant Buddha was begun in the first year of the reign of the Tang Emperor Xuanzong (713 AD), and completed in the 19th year of Emperor Dezong (803 AD), a total of 90 years. Besides all of these, by cruising over the Minjiang river right in front of the Buddha Mount (Lingyunshan) one will be able to have a panoramic view of the whole mountain as a huge sleeping Buddha. On Mount Linyunshan stands the Pagoda of the Souls. It is 125ft (38m) high built in the Song dynasty (960-1279) .Seen from the pagoda you can appreciate a beautiful view of the surrounding countryside.